In 1522, 4th March* was Shrove Tuesday and was the day of the special Shrovetide pageant, “The Château Vert”, which took place at York Place in London. 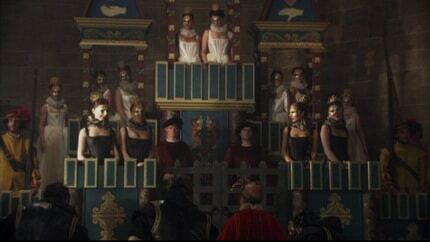 This pageant was Anne Boleyn’s first recorded appearance at Henry VIII’s court following her return from France, where she had been serving Queen Claude, consort of Francis I. The King’s sister, Mary Tudor, Queen of France played Beauty, the Countess of Devonshire played Honour, Jane Parker (later Boleyn) played Constancy, Mary Boleyn played Kindness and Anne Boleyn played Perseverance. These ladies, along with ladies playing the parts of Mercy, Bounty and Pity, were in a castle guarded by ladies called Danger, Disdain, Jealousy, Unkindness, Scorn, “Malebouche” and Strangeness. Eight men (Amorous, Nobleness, Youth, Attendance, Loyalty, Pleasure, Gentleness and Liberty), including the King and led by “Ardent Desire”, made an assault on the castle to rescue the Virtues. You can read chronicler Edward Hall’s account of the pageant in my article 4th March 1522 – Anne Boleyn Plays Perseverance. 4th March 1522 was also the day of the Shrovetide joust. At this joust, Henry VIII rode out with the motto Elle mon Coeur a navera, or “She has wounded my Heart”, and a picture of a wounded heart embroidered on the trappings of his horse. Although historians often connect this event to the start of Henry VIII’s relationship with Mary Boleyn, Anne Boleyn’s sister, there is no way of knowing which lady had wounded the King’s heart. Of course, in “The Tudors” series, the Chateau Vert pageant is where Henry VIII notices Anne Boleyn, but there is no evidence of Henry becoming interested in Anne this early. *Eric Ives dates the Shrovetide celebrations as starting on 1st March 1522, hence my original dating of this event to 1st, but I’ve since found that the pageant actually took place on 4th March. Edward Hall has an entry for 3rd March and then his account of the pageant. I was just wondering what Claire or Susan Bordo make of these male and female courtly love epithets? Or you? Imagine a lady called Amorous, Pleasure or Ardent Desire and we see how much of male ideal this knightly Romance was, don’t we? What a wonderful way to celebrate ShroveTuesday. It must have cost a fortune as well as being a marvellous sight. I think this was brought to life in the Tudors. The graces are ideals for women to aspire to. The costumes and sets are spectacular. I agree.I’m also wondering if anyone knows if there is a way to date Henry’s love letters to Anne?As it might be possible to know a more precise date when their relationship began.I think watching the play must have been lots of fun or being in it even better. Does anyone know what malebouche means. I know it translates to male mouth, but that doesn’t really tell me much. The only guess I have is it may be similar to having a sailor’s mouth, i.e. swearing a lot. In this case “male” is “mal”, i.e. bad, so “evil mouth”/”bad mouth”, a person that says evil or bad things.